HORWICH, a town, a parochial chapelry, and a subdistrict in Bolton district, Lancashire. The town stands 1 mile N of a station on the Bolton and Preston railway, and 5 WNW of Bolton. The railway station serves for it and for Blackrod, and has a telegraph. The town occupies the site of a Roman settlement; was a seat of cotton manufacture so early as the time of Henry VIII. ; carries on now cotton spinning, bleaching, and dyeing; also conducts trade in connection with stone quarries, fire brick, tile, and terracotta works in the chapelry, and with collieries there and in the neighbourhood; and has a post office? under Bolton, a church, three dissenting chapels, a national school, and charities £392. The church was rebuilt in 1831, at a cost of £6, 000; is in the pointed style; comprises nave and two aisles, with lofty tower; and contains a monument, by Westmacott, to Joseph Ridgway, Esq. Two of the dissenting chapels are for Independents; and one of these is a large and handsome edifice of 1855. The national school is a spacious structure of 1832. The chapelry contains also the village of Wilderswood, and is in the parish of Dean. Acres, 3, 230. Real property, £15, 880; of which £170 are in mines, and £82 in quarries. Pop., 3, 471. Houses, 682. The Stoner family and the Rev. Henry Wright are the chief landowners. The reservoir of the Liverpool water works, a large sheet of water, is in the W. The living is a vicarage in the diocese of Manchester. Value, £334. * Patron, the Vicar of Dean. The sub-district contains also a township of Bolton-le-Moors. Acres, 4, 656. Pop., 4, 051. Houses, 803. Local studies information is held at Bolton library. Details about the census records, and indexes for Horwich. You can also perform a more selective search for churches in the Horwich area or see them printed on a map. The Register Office covering the Horwich area is Bolton. Ask for a calculation of the distance from Horwich to another place. "HORWICH, a chapelry in the parish of Deane, hundred of Salford, county Lancaster, 5 miles N.W. of Bolton, its post town, 5 N.E. of Chorley, and 15 N.W. of Manchester. It is situated on the high road from Bolton to Chorley, and 1 mile from its station on the Lancashire and Yorkshire railway. It was formerly a Roman station. A large portion of the inhabitants are employed in cotton printing and bleaching, which latter is carried on to a considerable extent. The coal-pits are very productive, also some extensive stone-quarries. The reservoir of the Liverpool waterworks, which is of great extent, adjoins the W. end of this district. The soil is various. The living is a perpetual curacy in the diocese of Manchester, value £334. The church, dedicated to the Holy Trinity, was erected in 1831, at an expense of £5,848 15s. It is a stone structure, with a lofty tower containing six bells. The interior of the church contains a stained window, also a monument to Joseph Ridgway, Esq. The charities include a bequest of £142 per annum for church purposes by the late Joseph Ridgway, with a further endowment of £100 to the poor, the same amount to the minister, and £40 to the church school, at the decease of his widow. There is a National school. The Independents have two chapels, and the Wesleyans one." In 1835 Horwich was a township in the parish of Deane. 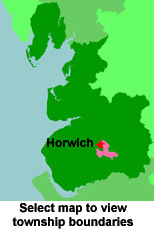 You can see the administrative areas in which Horwich has been placed at times in the past. Select one to see a link to a map of that particular area. A description of Horwich in the 19th century. View maps of Horwich and places within its boundaries. For probate purposes prior to 1858, Horwich was in the Archdeaconry of Chester, in the Diocese of Chester. The original Lancashire wills for the Archdeaconry of Chester are held at the Lancashire Record Office.